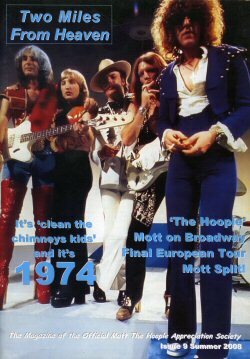 The Mott The Hoople appreciation society was set up in response to the interest shown in Mott The Hoople following the release of the Sony box set All The Young Dudes - The Anthology and its companion volume All The Young Dudes - The Biography. 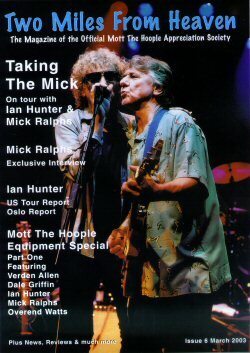 MTHAS was launched with the full approval of Verden Allen, Dale Griffin, Ian Hunter, Mick Ralphs and Pete Watts who all agreed to make themselves available for exclusive interviews to be published in Two Miles From Heaven. 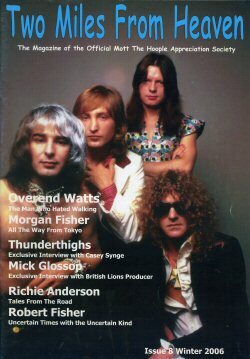 It was not MTHAS intention to remove fan support from other existing specialist magazines such as the excellent Outsider. 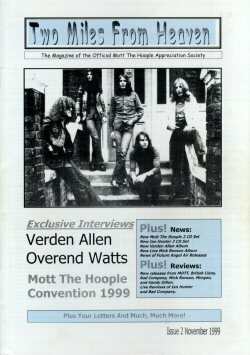 Rather, the organizers felt their position was to complement whatever was available today and to introduce a magazine which would be printed on art paper and was fully illustrated with photos, record sleeves, news cuttings, interviews, questions and answers, web site reviews and contact addresses and a letters column. 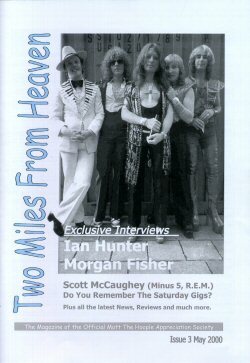 Two Miles From Heaven was published from 1999 to 2011. However, due to ill health the editor was no longer able to continue and MTHAS stopped. 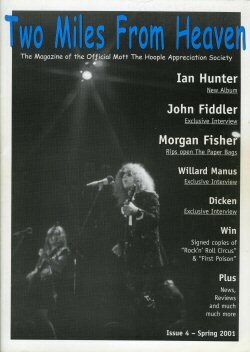 Two Miles From Heaven was the magazine of MTHAS. 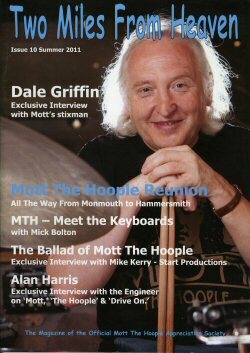 Exclusive interview with Mike Kerry of Start Productions (who were producing the Mott The Hoople DVD). Another excellent issue. Sadly, it was be the last. The production standards are as high as ever - how can I pick a highlight when it's all good?. 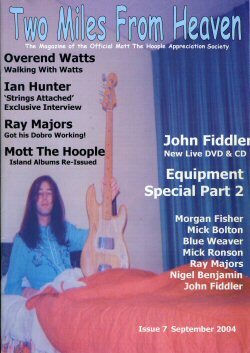 The highlight of another excellent magazine is part 1 of Watts' diary, worth the price of admission on its own (post-review note: this has now been published as The Man Who Hated Walking). "Do You Remember The Saturday Gigs?" 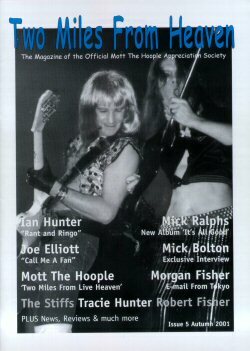 Review of The 1999 Mott The Hoople Fan Convention.